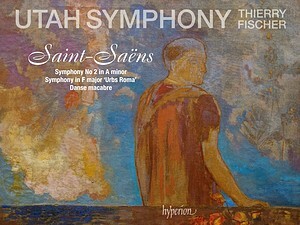 SALT LAKE CITY, UTAH (April 1, 2019) — This spring, Music Director Thierry Fischer and the Utah Symphony continue their Saint-Saëns recording cycle on Hyperion Records with Volume 2, comprising Symphony No. 2 in A minor, the Symphony in F major (“Urbs Roma”), and Danse macabre, featuring concertmaster Madeline Adkins. Launched to critical acclaim last winter, the three-volume set will be the first complete, commercial recording of Saint-Saëns’s five symphonies by an American orchestra, as well as the orchestra's first recording project with independent British label Hyperion. Volume 2 is included among the label’s May 2019 releases and is available digitally and in the UK on Friday, April 26 and in North America on Friday, May 3. Pre-orders are currently available from hyperion-records.co.uk. Saint-Saëns composed the F-major and A-minor symphonies when he was in his early 20s. The F-major symphony was written for a competition in 1856 and given a descriptive title (“Urbs Roma”) in keeping with the judges’ requirements. Saint-Saëns won the competition, but never promoted the work or had it published, unlike his Symphony No. 2 in A minor, which was completed in 1859, premiered in Leipzig, and performed in Paris the following year under Jules Pasdeloup, one of the leading conductors of the day. The symphonic poem Danse macabre was composed much further along in Saint-Saëns’s career, in 1874. The three volumes of this cycle mark Mr. Fischer’s fourth, fifth, and sixth recordings with the Utah Symphony. Volume 1 comprises Symphony No. 3 (“Organ”) in C minor, featuring organist Paul Jacobs; “Danse Bacchanale” from Act III of the composer’s opera Samson et Dalila;andTrois tableaux symphoniques d’après La foi. Volume 3 comprises Symphony No. 1 in E-flat major; the Symphony in A major, written when the composer was only 15 years old; and The Carnival of the Animals. Volume 3 is planned for release later in 2019, date to be announced. Throughout his career, Mr. Fischer has been especially active as a conductor of the French repertoire—from classics by Debussy and Ravel to contemporary works by Pierre Boulez and Tristan Murail. Of his 14 albums on Hyperion prior to these Saint-Saëns recordings, over half are devoted to works by Francophone composers, including Fauré, Françaix, Honegger, d’Indy, Lalo, Martin, Poulenc, and Widor. The Saint-Saëns cycle marks his first recordings of the French repertoire with the Utah Symphony, and following this project, an all-Berlioz album with the orchestra is also planned for release on Hyperion. In concert next season, he leads the orchestra in a season-long exploration of Messiaen’s Des canyons aux étoiles, a twelve-movement work inspired by the birds and rugged features of southern Utah. In the ten years since he became Music Director, Mr. Fischer has conducted numerous composer cycles at Abravanel Hall, and in addition to focusing on Saint-Saëns, he has led the orchestra in cycles of symphonies and concertos by composers from Germany, Austria, Denmark, and America. These performances include a two-season Mahler symphony cycle in celebration of the Utah Symphony’s 75th anniversary and its legacy as the first American orchestra to record the complete Mahler symphonies. This Saint-Saëns recording was made possible thanks to support from: Kem and Carolyn Gardner, Patricia A. Richards, and William K. Nichols. The Utah Symphony has released more than 100 recordings, and recent releases (on Reference Recordings) include Mahler’s Symphonies No. 1 and 8 (2015 and 2017, respectively) and Dawn to Dust (2016), which features three Utah Symphony-commissioned works by Nico Muhly, Andrew Norman, and Augusta Read Thomas. The orchestra’s discography with former Music Director Maurice Abravanel includes not only the complete Mahler symphonies, but also premiere recordings of works by Honegger, Milhaud, Rorem, Satie, Schuman, and Varèse. Utah Symphony | Utah Opera, the orchestra’s parent organization, reaches 450,000 residents in Utah and the Intermountain region, with educational outreach programs serving more than 155,000 students annually. In addition to performances in its home in Salt Lake City, Abravanel Hall, and concerts throughout the state of Utah, the Utah Symphony participates in Utah Opera’s four annual productions at the Janet Quinney Lawson Capitol Theatre and present the six-week Deer Valley® Music Festival each summer in Park City, Utah. For more information about the orchestra, visit utahsymphony.org. Now in his tenth season as Music Director of the Utah Symphony, Thierry Fischer has revitalized the orchestra with creative programming, critically acclaimed performances, and new recordings. Highlights of his tenure include a multi-season Haydn symphony cycle; additional cycles of symphonies by Beethoven, Mendelssohn, Brahms, Mahler, Nielsen, and Ives; and a tour of Utah’s five national parks. Appointed Principal Guest of the Seoul Philharmonic in January 2017, Mr. Fischer has also guest-conducted the Atlanta, BBC, Boston, Cincinnati, and Detroit symphony orchestras, Czech Philharmonic, Orchestra of the Maggio Musicale Fiorentino, London Philharmonic Orchestra, National Arts Centre Orchestra, Oslo and Rotterdam Philharmonics, Orchestre de la Suisse Romande, Royal Philharmonic Orchestra, Salzburg Mozarteum Orchestra, and the Munich Chamber Orchestra, among others. With the BBC Symphony Orchestra, he conducted the 2015 “Pierre Boulez at 90” concert at London’s Barbican Hall. Mr. Fischer made his conducting debut in his 30s leading the Chamber Orchestra of Europe, which he led in 2016 on a European tour. He has served as Principal Conductor and Artistic Advisor of the Ulster Orchestra (2001–06), Chief Conductor of the Nagoya Philharmonic Orchestra (2008–11), and Principal Conductor of the BBC National Orchestra of Wales (2006–12), which he led annually at the BBC Proms, frequently in performances of the French repertoire. For more information about Mr. Fischer, visit thierryfischer.com. Recorded live at Abravanel Hall (Salt Lake City, UT) on September 22 and 23, 2017 (Symphony No. 2), December 8 and 9, 2017 (“Urbs Roma”), and February 23 and 24, 2018 (Danse macabre). Ruwix is the best place to learn about the Worlds best selling puzzle toys. Check it out here.